Mr. A, my graduate from last year, made a big step this week. He took his very first “behind the wheel” flying lesson on his way to getting his private pilot’s license. If you have been a longtime reader of this blog you know that he has had this as a goal for many years. He actually took the plane off from the airport and then flew it by himself. I have a total phobia of flying so even thinking about this made me shriek on the inside. He knew this and didn’t tell me ahead of time that he was actually going to fly the airplane at his first lesson…he only said he was going to go talk to the instructor. Good move on his part since I probably would have done one of two things. I would have either thrown myself in front of the airplane so it couldn’t move or I would have been there with my camera to take photos. I’m sure he didn’t need me to do either of those things. Next lesson…this afternoon. Sidenote: He is also up for an internship in aviation maintenance at a local airport. This would be an answer to prayer. Look closely and you will see Half Dome in the distance (left horizon). The rest of the week was full of lots of outdoor time. 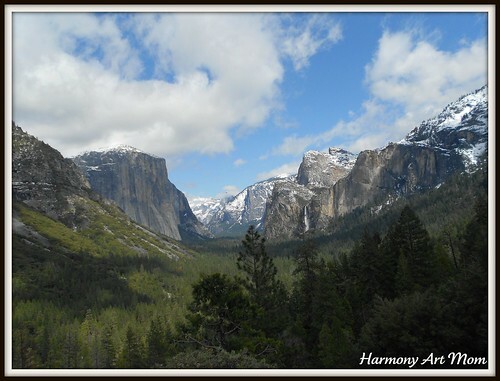 We took a day trip to Yosemite National Park to see the beautiful waterfalls that are flowing this time of year. We were treated to some magnificent wildflowers (which you can see a glimpse of over on my Handbook of Nature Study blog this week). Mr. B and I have been participating in the April GetOutside Photo Scavenger Hunt hosted by Go Explore Nature by taking walks/hikes every single day this week. You can see our photos on the Pinterest Board. We also worked in the garden pulling weeds, trimming bushes, and planting seeds. Mr. A rode his bike to work this week to save money on gas. We all have spring allergies. We have three weeks of school left for the year and I am feeling the pull of summer vacation. Letting go seems very bittersweet. Thanks for continuing to post even though your journey is almost over. You always reminds me to treasure the time we do have together even more :)! So I am just going to pause here at your top photo for a while. I might be back here with my afternoon coffee too. Stunning! In some ways the blue sky and the green trees remind me of the Yellowstone/Tetons area. So crisp and clear. You made me giggle about throwing yourself in front of the plane. Wow, this has been a huge week! And the possibility of internship – wonderful. Proud of you for not questioning yourself. And thank you for sharing these important steps in homeschooling. Wonderful post. Your posts are always sp encouraging and inspiring, Barb. Thank you for sharing your life with us. My kids may only be 7 & 4, but this post spoke to the challenges I think every mom faces. Truthfully, I feel like I’m let go a little more each day. Today it’s letting the kids climb a tree without help. Tomorrow it’s letting them fly a plane. Dear God, help us. Oh goodness… time flies, doesn’t it? I got butterflies and knots in my stomach reading this post. I’m close behind you (but fortunately *not* in regards to the flying!) and I appreciate your posts that chronicle your journey. Yes, it is a bittersweet (more sweet these days) journey. I didn’t think about it much with the two older children since I still had the two younger ones coming along. The flying part…I know he is prepared. He aced the written exam and he has been flying Flight Simulator for many years. He has two passions…the Bible and flying. He is hoping to combine both of them in his future. Yes, my heart swells. Hi Barb! I, too, am feeling summer’s pull. I love the idea of the outdoor photo scavenger hunt and the daily hikes! Your hikes look far grander than our, though. Regarding the flying: I was visiting a friend in Cheyenne several years ago, and her dh took me flying in a tiny plane — he let me take over the controls for a while, and I loved it! She was studying for her pilot’s license — a HUGE step for her because for years she couldn’t stomach flying with her dh. My second trip to Cheyenne I witnessed her first solo flight. It was marvelous! As usual, your post spoke to me in many ways. I’m so glad these days are more sweet than bitter for you. Oh, I’m with you on the flying! ((bites fingernails)) But you know – if it’s HIS goals and dreams than it’s wonderful…and he’s taken a big step in getting there! Same with your other son. It’s hard letting them grow up! I’m already feeling some gentle tugs now with my 13 year old! How exciting for both of your young men! You’ve given them roots and wings! (I dropped our youngest, our 11 year old daughter off for her first camp-out and was a little sniffly). You have done a great job raising independent young men! My son doesn’t want to fly, but he wants to sky dive. I told him when he is 18 and can pay for it himself, he can tell me when it is all said and done. I don’t want to know ahead of time! This resonated with me as my oldest is turning 17 in two days and I am feeling those mixed emotions. 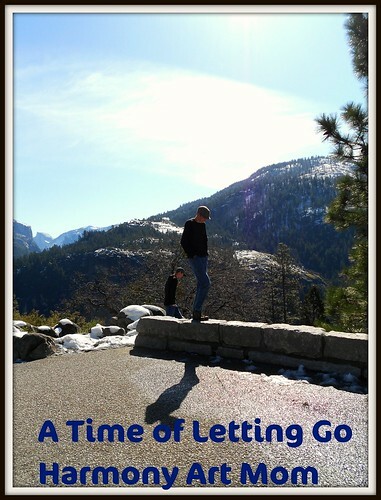 Letting go seems contrary to mothering in so many ways, yet it is a necessary step. It really sounds like your son is following his dreams, which is pretty amazing!